Snack Girl has had MANY readers tell her to try "green" smoothies. Well, before last Tuesday, I had one word for them - YUCK! Yes, I had been open to green smoothies and then I tasted them. I felt like a cow chewing her cud (and I already feel like a cow for other reasons). I drink a green smoothie (fruit plus some kind of greens) every day for breakfast, with a couple tablespoons of ground flax. Not only does this allow me to start the day with about 4 servings of fruits and veggies, I notice such a huge difference in my skin and nails when I follow this routine. When I fell off drinking smoothies, my forehead broke out and my skin looked dull - but after a week of drinking them, the acne cleared up, my skin is really glowing, and the weirdest thing is that the whites of my eyes are whiter! Try it - I virtually guarantee you'll see a difference! Wow! That seems like a lot for a smoothie to do, so I e-mailed Stacie for her recipe. I was concerned about whether my blender was up to snuff, because she used a "VitaMix" blender. So, I used a conventional blender, and I skipped the flax seed and I made her smoothie and handed it to my lab rat (AKA husband) who pronounced it delicious! I had to agree. I didn't notice the kale and I wasn't missing yogurt, honey, or anything else. It tasted fresh, healthy, and I wanted MORE!!! My husband added some maple syrup because he wanted more sweetness. That is the great thing about making your own smoothies - they are totally customizable. Try this on your kids and watch them slurp down the most nutritious green vegetable on the planet. They will get 207% of their daily value of Vitamin A, 10% of their DV of Iron, 12% of their DV of Calcium, etc. Got any green smoothie recipes? Please share. Awesome! I can't wait to try this! Don't you need to use ice to give it the smoothie texture, or do the frozen berries do that? thanks! @Christine - the frozen berries give it the "smoothieness" - it really works! Thanks for your question. I've tried spinach in green smoothies and I really don't like them! Does the kale make a difference? Does the taste really blend in? I'd love to add veggies to our smoothies, but I haven't found a non-offensive way to do this yet. I've never tried kale before, so I don't know what the flavor is like. @Renee - I really didn't notice the kale - which shocked me - I used very fresh kale and it didn't taste like anything. Keep in mind that the bananas can be frozen, too. I break bananas into chunks and put them in baggies to freeze. They also help my smoothies feel thicker (and so will the flax seed). You can use use coconut water or rice milk for the water and/or add a scoop of a high quality protein mix. Kale is a great "green" to add and so is spinach. Honestly, you don't taste either one ;-) Happy slurping! I start every day with a smoothie! to make yours a complete and balanced meal, add a small handful of almonds (good fat) and a scoop of protein powder. What about putting protein powder in the mix? This picture looks like a chocolate/banana protein shake. Doesn't look berrylicious to me. :) Just curious. This is very intriguing, and I will have to give this a try. I just picked up some kale yesterday and was looking for new ways to prepare it. Plus, this will give me an excuse to use up some of the frozen blueberries in my freezer. Looks delicious! Cannot wait to try this! What I'm curious about is how much ground flax seed does Stacie use? I love the stuff and would add it to mine. This sounds great, I can't wait to try it and get my kids slurping too! This sounds like a smoothie recipe that is easy enough to do. I do have one concern about smoothies, though. 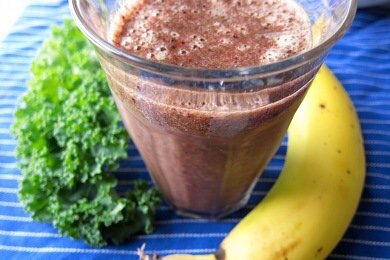 Are you removing the some of the fiber and goodness of fruits & vegetables when you juice them? I thought according to the food pyramid, you shouldn't have more than one glass of juice, since it is lower in nutritional value than the whole food. I found this quote on-line, but I was wondering what your thoughts were. That, said Dr Frankie Phillips, from the British Dietetic Association, is not the case. "Juicing involves the removal of fibre and this removes some of the nutrients that would be found in a whole fruit or vegetable," said Dr Phillips. "There is likely to be a more concentrated level of sugars naturally present in the fruit, and if a juice is sipped over a long period of time, the fruit juice, which is quite acidic, can damage dental enamel. In addition, some smoothies are very high in calories, with added whole-milk yoghurt, and even peanut butter and chocolate." I've been wanting to get into this. I've read about and heard from friends about all the benefits of juicing and having green drinks. Thanks for recipe. Certainly seems like a good way to start the day. Hey, maybe I'll even swap my morning coffee out for one of these on the way to work instead.. would probably provide more energy in the long run, rather than a brief boost in the morning that coffee provides. I LOVE green smoothies and was changed by them over a year ago. I add cucumber (peeled) and some baby carrots, probiotics. I use spinach and roman lettuce. I certainly can't taste it as the frozen berries truly mask the taste. Very refreshing and you can add a hint of OJ and I add some ice to make it truly thick and "slurpy"! Found a great stuff with The Green Smoothie Queen who is trying to educate the world about raw foods and in particular, green smoothies. They don't have to be green but the greener they are, the better they are for you! Congrats Lisa!! Welcome to a wonderful new health drink. Awesome in the summer time! @Amy -Smoothies contain all of the fiber that the fruits and vegetables initially came with blended up while juicers extract the juice and leave the fiber behind. I think because the whole fruit is being blended a smoothie is a healthier juice. If you want to keep on making morning smoothies, I definitely think you should invest in a VitaMix (or its competitor, the Blendtec - both have pros/cons, but I have a Vitamix). It's amazing and you can throw things like flax seeds, watermelon with the skin, strawberries with the hulls, and frozen berries right at it and it turns everything smooth and creamy. I loooove mine. Yay green smoothies!